$200.00 USD Daily Limited time offer price! 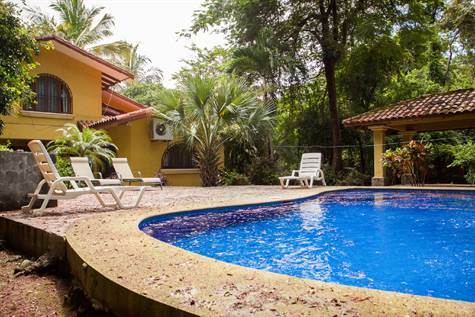 Casa Amarilla is a charming 3 bedroom, 2 bath home, with a brand new swimming pool, located in Palm Beach Estates, Playa Grande. A beautiful and well cared for house, fully stocked with everything you could need as well as some extra perks that you will enjoy. Conveniently situated just around the corner from several restaurants as well as the local grocery store, and only a short walk to the beach. The property offers gated and secure off street parking, car port, and a well manicured tropical garden. A large covered veranda hosts a lovely 8 person dining table, plus comfortable outdoor seating offering cool shade all day. The home comes fully equipped with all the kitchen supplies you can imagine. The living room is adorable, comfortable, and cozy with a fully stocked DVD library, cable TV, and high speed wireless internet. The first floor has a spacious bedroom complete with a full hanging closet, a dresser, as well as a surf board rack. Adjacent to the bedroom is a full bath with a handy closet for extra towels. The second floor hosts two additional rooms which share a very spacious bath with double sinks and a luxurious Jacuzzi tub. Each bedroom has closets, dressers, laundry hampers, trash bins, and bedside reading lamps, as well as ceiling fans and air conditioners for your comfort. AC, and hot water through out the house. Separate laundry room available. Beautifully decorated and well thought out, this is truly a perfect vacation rental home. Housekeeping is included in the price one cleaning per week. Full concierge service is available for you from the property managers can help arrange any tours and activities you will like to do while staying at Casa Amarilla. This house is new on the rental market, and we're offering this super low rates for a limited time.